If you’ve been to the market recently, you may have noticed Norman and his wife Aimee. They make up the entire labor force behind Mountain Ranch Organically Grown and sell organic chickens, beef, schmaltz (chicken fat), and stock. They also offer a few prepared items, like tamales and soups made with their chicken, beef, corn and vegetables from their garden. Norman has been farming as sustainably as possible ever since his family moved from the suburban East Bay to the rural area of Mountain Ranch in Calaveras County (around 3 hours to the east) 42 years ago. When Norman graduated from high school he took over what was then his mom’s turkey farm and raised the birds free range (although the term wasn’t around then) on contract for a large corporation for over a decade. Then, in 1983, the company stopped buying. Norman started doing odd jobs and continued growing a small amount of food to maintain the farm lifestyle. “It was like I had to wait ‘til society caught up,” he says. 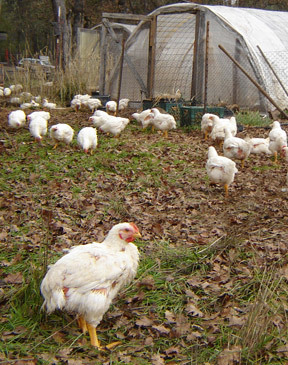 Mountain Ranch Organically Grown raises flocks of 500 - 800 chickens at a time, around six weeks apart. They pasture the chickens during the day (they’ve recently started raising a variety called Freedom Ranger that is especially bred for the task) and feed them organic grain in a coop at night. They also raise around six cows at a time, and slaughter an average of two a year. Finding a legal, organic processor that would take them on — since most meat processors have consolidated and contract mainly with industrial-sized farms — was an initial challenge for the couple. So they took a risk and raised a larger flock than they might have to begin with, just to reach the minimum numbers for an organic processor in Stockton, CA. “If we were any smaller, they wouldn’t be interested in us,” says Norman. Now that Mountain Ranch is reaching a larger urban audience, the ranchers are seizing the opportunity to take their practices beyond what their organic certification requires. As a start, they’ve planted an experimental crop of barley and wheat — chicken feed — that they plan to grow without irrigation. Photos of the farm were taken by Normal Gunsell. Mountain Ranch Organically Grown will be in the market on Saturdays all year round.